Angelic language is transcendental and all-embracing. It is not restricted to a particular dialect or jargon. The best thing about Angelic language is … ‘we all speak it’. 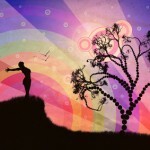 Yes, every man, woman, child, animal, and plant can communicate with heavenly souls. There is a diverse assortment of angelic descriptions and interpretation of conversations and encounters with spiritual entities. Stories can be re-hashed and changed as they are re-told over and over. Does this make the conflicting versions any less meaningful? No, I believe it does not. 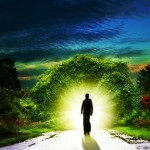 Individuals hear, see and sense what revelation is intended for their personal journey. Symbolism and metaphors are part of the language of the psyche and can be included in the many ways that the angels speak to us. Symbolism is also at the core of tarot. This is why tarot readers often have a close relationship with angels. Symbolism is a universal tool of communication through objects that represent something to help you grasp an intricate situation. Suddenly what was inconspicuous, over-looked or neglected becomes evident. Flowers, white fluffy clouds, feathers, birds, and animals are but a few omens the angels use as an indication of the approach of something. You might find yourself coming across the same thing that stands out. Over the past few days, I have had the name of a book mentioned three times at random and by different people. I have not thought about this book in years. I must dust it off and read it again; there will be significance for me. Think about the times in your life that words from a specific song would play over in your head or the same stranger that you would see no matter where you went. Then there was the period you couldn’t explain an attraction to a peculiar colour, culture or food. If something has the ability to draw your attention then it has the potential to be an instrument for revelation from the angels. Angels are pure love energy dressed in beauty, compassion, and joy. The gentle utterance will, therefore, be expressed through the exquisiteness and delicacy of creation. The pastel colours of a rainbow directly in front of you as you drive home after a challenging day is reassurance that the effort is worthwhile. The feint scent of rose calming your emotions is a gift to guide you along in harmony. A child picking you a flower is a token from the angels. Unusual markings on a tree trunk, an odd shaped rock or bright orange foliage on an autumn day can all be acknowledgments from our guardians. Our amazing earth is a canvas for artistry brilliance of the angels. Every leaf, blade of grass, petal, ocean wave, raindrop or grain of sand has the potential to illustrate a message. Each stroke of a paintbrush in a picture can speak to the onlooker on a sub-conscious level. Tarot cards have the potential of communicating through the same process; they are also a canvas for ‘painting a picture’. Premonition has been referred to as ‘handwriting on the wall’ and so through absorbing the essence of a tarot card illustration, one is able to penetrate the message. This to me as a psychic tarot reader is a form of divination and a colourful way to work with my angels and spirit guides. You too can join the angels and colour our world a wonderful place for future generations to come. Angels are prominent throughout tarot cards. They display a glimmer of hope for all of us. 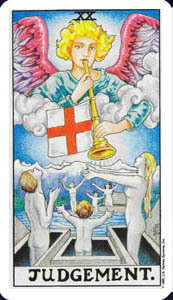 Archangel Gabriel is blowing the trumpet to remind us, “we can always rise-up and live a better life”. We have no right to judge others but need to examine our own lives. Dawn Alice is a Brisbane Psychic, who has superior knowledge of the Tarot and Numerology with expertise in the area of metaphysics. She is also a Reiki Master with a deep understanding of Crystal and Colour Therapy. Click here to go to Amazon for her books and to learn more.